Mariage [C6141] - $12.22 : Yarn Tree, Your wholesale source for cross stitch supplies. Cross stitch pattern by Madame Chantilly. 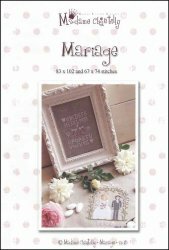 Two designs, a newlywed couple standing under a floral arch and a Sampler to celebrate a wedding or anniversary. Stitch count for Bride & Groom is 83 x 102 and stitch count for the Sampler is 67 x 74. The Bride and Groom were stitched on #4138 Belfast Raw Linen and the Sampler was stitched on #3319 Newcastle Raw linen.